Borgo Marinari is a unique place , dominated by the beautiful castle and the spectacle of the Bay of Naples. Here you will find one of the most famous restaurants of the city , right on the harbor , with outdoor tables and air-conditioned hall . The elegant ambience , the courteous service and the sea air will prepare you to taste the specialties of the house , mainly based on fish , ending with desserts of the Neapolitan tradition , all accompanied by local wines especially . 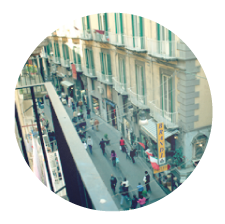 In the heart of Naples in the Spanish quarters a few steps away from Chiaia.La pizzeria Nenella is a pizzeria / fast food / pizza takeaway of Via Santa Caterina da Siena and Vico Mortelle; The pizzeria as well as having the wood-burning oven is also poultry shop. The chicken can be served is not the classic grilled chicken, but it is cooked and seasoned in the wood oven, in this way is added to the meat tastes different than what you're normally used to enjoy. Then there are the panuozzi that are truly exceptional and of course the classic Neapolitan pizza; personally we can recommend the classic Neapolitan fried pizza, a specialty in the best Neapolitan tradition. A history spanning over sixty years . It was 1943 and " Mimi " to the railroad was born in the month of September. Over the years , what was formerly an inn in the heart of Old Naples , which was frequented by the most famous Neapolitan characters , such as TOTO ' , the De Filippo and many others, today it has become a point of reference for all the Neapolitans and do not . Renovated and enlarged , but not changed in the culinary traditions and reliability typically Neapolitan : the wonderful dishes that " Don Mimì " offers its guests, now as before, are dedicated to the quality of the ingredients and the skill of the preparation. A funny anecdote alloy indelibly the restaurant to the life of Toto and the history of cinema : after the war Toto was performing in the theater Orpheus ( attached to the restaurant ) and the handover was in the dressing room a plate of spaghetti with tomato sauce ; but by Mimi forgot to deliver the cutlery, so Toto from one scene to the other of the show ate spaghetti with his hands. Incredible scene that Prince De Curtis wanted to bring back , as he himself confessed , in the famous scene of the play " Misery and Nobility ." Year of grace 1919. History of a restaurant in the corner of the most beautiful sea in the city, breathe the soul of Naples. Donna Emilia Del Tufo , the Bersagliera , started the activity of the restaurant destined to become one of the most famous in Naples , attended among routes must for visitors to the pier below città.Sul Via Partenope , including boats, nets , traps and clothes hanging in the sun, Emilia woman preparing food for his large family engaged in the rental of boats. But then also passed to prepare simple breakfast of steaming noodles and wine shops to sailors and students. And so, with modesty and tenacity, professionalism and courtesy, has won the hearts and palates of its guests. Also in the kitchen the Bersagliera , luciana true did not let groped by infidelity tradition. On the tables simply does not offer too much sought after dishes or necessarily innovative : the menu offers tasty recipes popular , prepared at the time , with sincerity and care. The dishes are reminiscent of the simple cuisine invented by the people of luciani , basic ingredients of a food -poor , but rich in flavors and aromas , without artifice , welcome to the principles , stars and ordinary people. Place of worship for lovers of good food. In the central Via Santa Brigida, a characteristic narrow street in the old town center of the city, the local taste is simple and attentive to every need of its guests. A line of thought and philosophy relating to eating well, namely: materials use fresh, unadulterated, unsophisticated; use them with skill, with grace, with fidelity to the ancient recipes of good Neapolitan cuisine; present them with extreme decorum, with impeccable service, with an eagerness never overwhelming, and with a cordiality without emphasis; abide by these rules to provide a list variatissima, always chosen meals, clean, very healthy to be able to order with my eyes closed, with a smile of confidence. Great and the fish and a delicious fried fish. A guarantee.